in korean! | Flickr - Photo Sharing! beetgreen, prettiest.teacup, and 2 other people added this photo to their favorites. oh that is too cute! congrats. 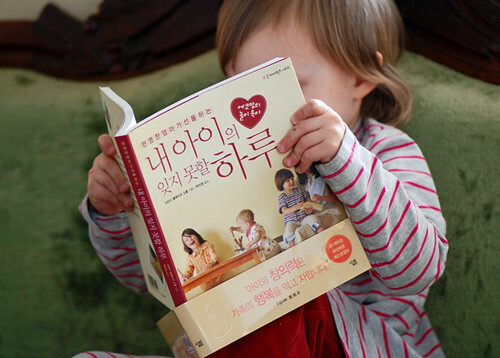 i knew she was smart, but korean at her age? wow! and congrats, amanda. that is really cool. in Korean!!!!! Hope it sells like hotcakes! how exciting. I spent summers in Korea when I was younger. How exciting to be in print there! too cute. i gave a copy of your book to our library for my birthday. She's so talented! Little cutie! do you think it will come to japan? I bet she understands it better than I do!